Oct. 1: Is the Presidential Race Tightening Heading Into the Debates? There are two basic types of information that we’re looking to discern out of each poll. One is simply the raw number: how much does the poll have President Obama leading or trailing Mitt Romney by? The other is the trendline: does the poll show toward a shift toward either candidate from previous editions of the same survey? In the long run, you’d hope that the answers to these questions are compatible with one another. If a set of polls show good numbers for Mr. Obama, you’d expect them to be good in both an absolute sense and also relative to earlier points in the race. But sometimes there are days when looking at the polls through these different frames produces a somewhat different take on them. Monday was one such occasion. There were nine national polls published on Monday, which are listed in the table below. On average, they showed Mr. Obama with a 3.5 percentage point lead over Mr. Romney. That’s smaller than the leads we were seeing in national polls last week, which seemed to be concentrated more in the range of a five- or six-point lead for Mr. Obama. It also suggests a smaller lead than recent state-by-state polls seem to imply. So has the race already shifted back toward Mr. Romney some? Perhaps, but this is less apparent from the trendlines within these polls. If you compare the nine surveys released on Monday against the last time they were published (in all cases, the comparison poll postdates the Democratic conventions), only four showed a shift toward Mr. Romney. An equal number, four, showed Mr. Obama gaining ground instead, while one poll remained unchanged. In all cases but one, the shift was extremely modest — within one percentage point in one direction or the other. The exception was a new CNN national poll, which had Mr. Romney closing his deficit from six points to three points. On average, however, the polls showed only a 0.2 percentage point gain for Mr. Romney — not a meaningful shift in either a statistical or a practical sense. And yet this simple version a trendline analysis does not tell the whole story either. Mr. Romney had appeared to lose further ground in the polls following the public release of his “47 percent” comments. All of polls that are used for comparison were released after the Democratic convention, but some predated the “47 percent” tape. It’s good for Mr. Romney that his national numbers on Monday looked more like those from just after the Democratic convention, when they weren’t great, rather than those from the past week or two, when they were worse. The FiveThirtyEight forecast model can account for these various contingencies, looking at exactly when the prior editions of a survey were released in order to calculate the consensus trendline. Viewed in this way, the national polls on Monday did contain modestly good news for Mr. Romney. But that doesn’t tell the whole story either, because there has also been a large volume of state polls released over the past day or two. Those polls can also be informative about the trend in the race. And in the state polls, it’s been harder to find evidence for a favorable trend for Mr. Romney. If anything, the opposite seems to be true. This was particularly the case in a University of New Hampshire survey published on Monday, which had Mr. Obama leading by 15 points in the Granite State — up from just a five-point lead in a poll taken just after the Democratic convention. The University of New Hampshire poll has a history of being fairly volatile, perhaps in part because voters in New Hampshire can be fickle with their political opinions. The poll certainly qualifies as an outlier relative to the consensus evidence in New Hampshire. At the same time, it’s not the kind of thing you’d expect to see if Mr. Romney were gaining ground in the race. Mr. Obama, not Mr. Romney, has also gotten highly favorable trendlines in a recent set of state-by-state polls released by the firm We Ask America, many of which show him with a considerably larger lead than he had before the conventions in those same states. The gap between state polls and national polls, which looked to have narrowed some last week, seems to be widening again. Perhaps appropriately given the mixed evidence on Monday, the FiveThirtyEight models produced something of a split verdict. Mr. Obama came off his highs in our “now-cast,” which projects what would happen if the election were held today. That version of the model had previously given Mr. Obama a 5.9 percentage lead in the national race, but it declined to 5.5 percentage points on Monday. Why are these “now-cast” numbers higher than the most recent national polls seem to suggest? In part because of the factor that I mentioned before — the “now-cast” uses state polls along with national polls to calculate its estimate of the national popular vote, and the state polls are a bit stronger for Mr. Obama. 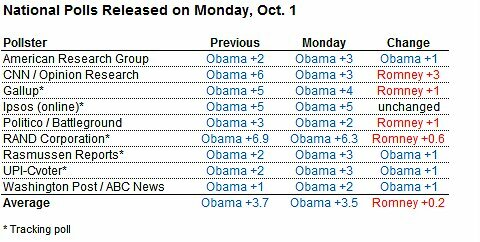 Also, last week’s national polls, which were more in the range of a five- or six-point lead for Mr. Obama, still have some influence upon it. The Nov. 6 forecast, however, our signature product, is already assuming that Mr. Obama’s numbers will decline some, in large part, because it continues to weigh economic factors along with the polls. Those economic factors, in view of the formula, are more in line with only a very narrow win for Mr. Obama, on the order of two or three percentage points, similar to the margin by which George W. Bush defeated John Kerry in 2004. As we get closer and closer to the election, these economic factors will receive less weight, until they phase out completely by Election Day. But they continue to exert some influence on the forecast for the time being. In the Nov. 6 forecast, Mr. Obama’s projected margin of victory in the popular vote declined to 4.1 percentage points from 4.2. However, his probability of winning the Electoral College increased by a trivial amount, to 85.7 percent from 85.1. This is an awfully messy story, but our job is to relay the story that the data tells, as interpreted through the lens of our models. Sometimes that story just isn’t a clear one. But let me leave you with two themes that are at least reasonably well in line with the consensus of the evidence. , so sometimes they’ll have a different take on the polls. Second, you should continue to watch the divergence between state polls and national polls. As of Monday’s forecast, Mr. Obama was projected to win 22 states totaling 275 electoral votes by a margin of at least 4.7 percentage points — larger than his 4.1 percentage point projection in the national popular vote. That speaks to a potential Electoral College advantage for him. But it’s important to watch the states that are just on the brink of this threshold, like Nevada and Ohio, or those where the polling has been varied, like New Hampshire. Without Nevada, for instance, but with the other 21 states, Mr. Obama would be projected to a 269-269 in the Electoral College — which he would probably lose in the House of Representatives.